In general, the definition of a tableau (derived from the French) is an artistic grouping, stage presentation or scene. 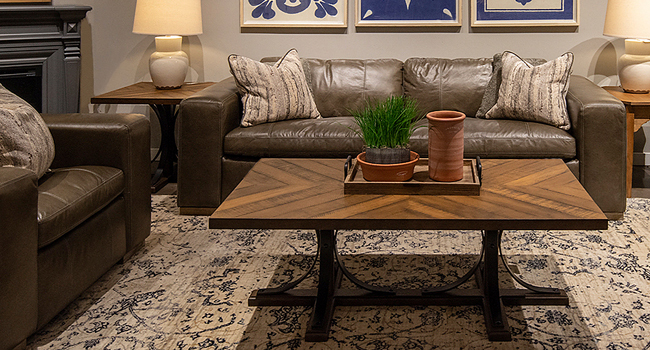 As it relates to your home's interior, you probably picture a beautiful tabletop. It can be anything from a stack of books on an end table with a vase of flowers perched on top, to an elaborate grouping of treasured objects spread across a fireplace mantel or console. Think of a tableau as a calling card or preview of the rest of your home that expresses your personal style in a dramatic, fun and artistic way. It can be purely decorative or a combination of decorative and useable objects. Show Off a Collection || Not sure what to do with your growing collection of vintage pottery? 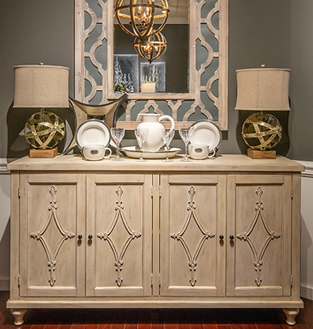 Arrange a group at the end of a credenza or on top of your kitchen cabinets. To make the tableau more eye-catching, play with scale and color. Place tall and narrow pieces next to stout ones, and if the items are color coordinated - say blue and white, or green, yellow and chartreuse - your grouping will be more striking. If you have an abundance of framed photos, place them together on top of a dresser with a lamp, arranging them by descending size, so 8"x10" frames are in back, then 3"x5", then mini frames in front. Maybe add a long peacock feather at the front of your tableau for the finishing touch. Rearrange Anytime || With any tableau, you have complete creative license to express yourself freely. Whether you keep it to just three items for simplicity or pile on multiple pieces, you can always change, delete or add items, even making your vignettes worthy of a still life painting. Declutter || Instead of placing your collections haphazardly, think about putting them on a tray to avoid a cluttered look. The great thing about a tray? You can move it – and everything on it – with ease. A recent trend involves displaying small objects under glass cloches of varying sizes – another easy way to declutter and keep intricate items dust free. Sometimes symmetry helps to declutter when you have numerous objects. A cluster of small bottles and books on a table gain structure if they're flanked by a pair of lamps, for example.